The audio CD is on its last track... Internet radio, anyone? I don’t think anyone will disagree with me when I say that music still represents the most important element in an infotainment system. Just look at the sound system capabilities in new cars. Base systems today have at least 6 speakers, while systems from luxury brands like Audi and BMW boast up to 16 speakers and almost 1000 watts of amplification. For nearly as long as I can remember, cars have come with CD players. For many years they’ve provided a simple way to take your music on the road. But nothing lasts forever. Earlier this year, Ford announced it would discontinue CD players in many of its vehicle models. Some industry pundits have predicted that CD players will have no place in cars in model year 2015 and beyond. A few weeks ago, Side-Line Music Magazine reported that major labels plan to abandon the CD format as early as 2012. This revelation has created a flurry of activity on the Net, but the labels have yet to confirm it’s true. The fact is, CD sales have declined steadily for the last several years, down 16 percent in 2010 alone. Digital downloads (the legal kind), on the other hand, have been growing quickly and are expected to exceed CD sales for the first time in 2012. Where does that leave us in the car? Obviously, media device integration will be key in the coming years. QNX Software Systems has long supported Apple iPod integration and supported Microsoft’s ill-fated Zune for a while. USB connectivity is a given, and soon you’ll be able to stream music from your phone. supports both Pandora and iHeartRadio. But what’s more exciting is how radio is evolving in the vehicle. Along with the steering wheel, radio has been a staple of car pretty much since day one. As the connected vehicle moves to the mainstream, internet radio will become a huge part of the automotive experience. Companies like Slacker extend the concept of radio beyond audio to include artist bios, album art, photos, reviews, and more. Pandora, through its work with the Music Genome Project, expands the musical experience by playing songs it predicts you will appreciate. 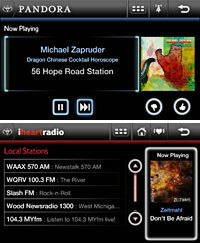 iHeartRadio aggregates American radio stations for replay throughout the US. TuneIn takes it one further with a global view. Driving down highway 101 in California, you’ll be able to tune in all your favorites from around the world. These services are changing the way people consume music. Today, I rely on my car radio not only to entertain but also to educate by constantly exposing me to new artists and content. Internet radio in the car will expand my horizons even further. And as online music stores like 7Digital integrate their service with the internet radio stations, I’ll be able to download the song I just heard at the push of a button. Not good for CD sales, but it seems that’s the way of the future anyway. We are, of course, working with the leaders in internet radio and online music services to bring them to a car near you. Can HTML5 keep car infotainment on track?